In the first three parts of this series, I discussed how Indiana so badly botched its negotiation with Kentucky on the Louisville bridges project that its share of the project went up by $200 million at the same time the total project declined in cost by $1.5 billion, how this will result in $432 million being drained out of regular highway funds to cover a resulting tolling gap, how tolling likely results in Indiana paying even more, and the significant risks Indiana has taken on by agreeing to build a tunnel in Kentucky. Amazing as it sounds, Indiana’s biggest road project is now a $795 million, 1.4 mile highway in the state of Kentucky. The first step is to kill the ludicrous $261 million “tunnel under the trees” in Prospect. I can’t speak to the veracity of this site since I haven’t investigated the matter personally, but a local named Denis Frankenberger recently filed a petition with the federal government to remove the expanded historic designation of the Drumanard estate. He alleges that Kentucky officials acted unethically in undertaking the proposed listing specifically to stop the East End bridge, and that there are numerous factual errors in the original filing that should result in it being withdrawn. He includes a pile of documentary evidence on this. Delisting the woods and cancelling the tunnel makes a ton of sense, especially since no buildings would be touched in any case. Also, it isn’t necessarily true that a historically significant property can’t be affected by a highway in any case. Regardless, where there’s a will, there’s a way. Kill the tunnel and save some more bucks. And even beyond that there’s probably still more savings to be had on the Kentucky approach. I will only briefly cover this here since I’ve written about it extensively before, but 8664 is a plan to build the East End bridge, re-route I-64 through traffic across the resulting beltway, and tear down the I-64 Riverfront Parkway in downtown Louisville, reconnecting downtown to the river in the process. As a side benefit, Spaghetti Junction would be greatly simplified. Riverfront Parkway would be reconstructed as a surface boulevard, and I-64 outside of downtown would be re-signed as I-164, providing continued freeway access from Indiana and the East End to downtown on all existing routes. The proposed new downtown bridge would not be built. 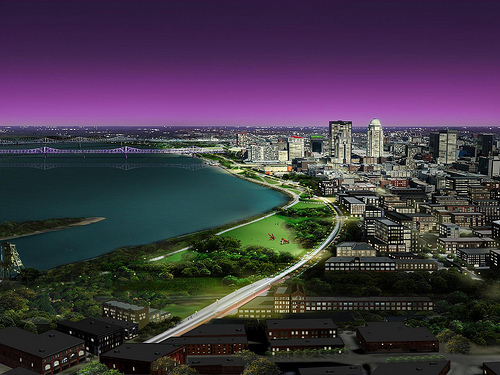 This would save a ton of money – big money – and be much better for downtown Louisville to boot. What’s not to love? Better and cheaper is my ultimate combo. You might also enjoy this recent NYT piece, “Parks Like Madrid Rio Stand Where Freeways Once Did.” (Big differences between Louisville and Madrid though: in Louisville there is no tunneling and the park option actually saves a boatload of money). Neither state will construct anything in the other state. Reversion to the status quo ante on the cost allocation: Indiana pays 100% for everything on the Indiana side, Kentucky 100% of everything on the Kentucky side, and the two states split the bridge itself 50/50. Allocation of revenue on a similar model: 100% of all Hoosier motorist tolls to Indiana, 100% of all Kentucky motorist tolls to Kentucky, all other tolls split 50/50. I think this is fair. I think there are potentially other fair ways to do too. The key is to have something that is prima facie fair, and above all is fully vetted with the citizens and leadership of each state in a public way, not done in a backroom deal and announced via a press release. To show the size of the impact we are talking here, if we just did one thing – revert to the original cost split deal, Indiana’s cost would decline from $1.3B to $839M – a savings of $514M to Indiana alone. This means Indiana wouldn’t have to take $432M away from other projects to cover a funding gap on this one. And guess what? Kentucky still would get the lion’s share of the savings, which is only fair since the big item in the savings was reducing the scope of the Spaghetti Junction interchange on that side of the river. Still, $839M is a huge amount of money, no two ways about it. And getting back down to this would be all for nothing if the toll revenue split ends up sending a bunch of Hoosier money across the river to finance Kentucky’s share. As a blogger with limited resources, I was only able to do a preliminary investigation here based on publicly available documents. But it seems pretty clear that this deal has a whole lot of bad elements about it. Again, Indiana’s cost went up by $200 million at the same time the total project cost went down by $1.5 billion. This poor renegotiation of the cost split means that Indiana will now have to use $432 million of regular highway funds instead of fully delivering the project via a public-private partnership and tolling. The use of tolls puts Indiana at severe risk of paying still more for the project – and Kentuckians see this as a big advantage. And Indiana has agreed to built a grossly overpriced $795 million 1.4 approach highway in Kentucky with a risky $261 million tunnel under some trees. I’d certainly encourage the traditional media to step up and do a more thorough investigation than I’m able to on my own, though I realize they are also under tremendous pressure, financial and otherwise. There is a huge amount of money at stake and a whole boatload of critical unanswered questions. As a supporter of 8664 I can only hope that Indiana agreed to take on the East End Bridge with the specific intent of killing the Tunnel. There is no way KY Transportation Officials can do this b/c of the good old boys/back room politics involved. I’ll do an a la carte agreement. Total agreement on #1 and #2, but on #3, I see the positive benefits of reducing the costs further as eliminating the need for tolls entirely, or nearly entirely. It’s hard for me to support any transportation project unless the taxes we’re already paying can cover it, even if that includes loans against future taxes. To me, a toll is a new tax that would especially harm the working poor. Also, does anyone know if tax increment financing has ever been seriously discussed? Certainly, there are business zones on both sides of the river that get enormous benefits from the East End Bridge’s completion. As far as a downtown bridge is concerned (which I don’t think is necessary anyway), this idea might not apply very well. I consider bridges, in general, to be boondoggles: they simply shift property values from the more costly municipalities to less costly municipalities, encouraging sprawl, and contributing little net, medium- or long-term economic benefit. Infrastructure for public transit, cycling and walking represent a far higher rate of return than roads, highways and bridges, especially if one considers the external costs of the automobile (congestion, sedentary lifestyles, stress, air and noise pollution, collisions). And, typically, tolls pay for operational and maintenance of highways and bridges, not the capital costs. Perhaps slightly on the edge of topic – some bridge byproducts such as underpasses are here to stay – Here, a project to transform the dark and vacant land under the Louisville side of the George Rogers Clark Memorial Bridge.